Add a modern look to any bathroom with this piece from Delta. Turn your bathroom into a stylish space with this dual-control faucet. This item's easy-to-install deck mounted design gives a fresh look to any counter top. This faucet is WaterSense certified, using less water to work so you have a smaller utility bill. The graceful body and elegant embellishments of the Rila Collection give it a refined air that resonates in the bath. Rila also features Deltas SpotShield. Technology that helps to keep your faucet cleaner for longer, by resisting water spots and fingerprints. The included pop-up drain with unique Worry-Free drain catch helps to ensure valuables don't wash down the drain. You can install with confidence, knowing that Delta faucets are backed by our Lifetime Limited Warranty. Delta WaterSense labeled faucets use at least 20% less water than the industry standard, saving you money without compromising performance. 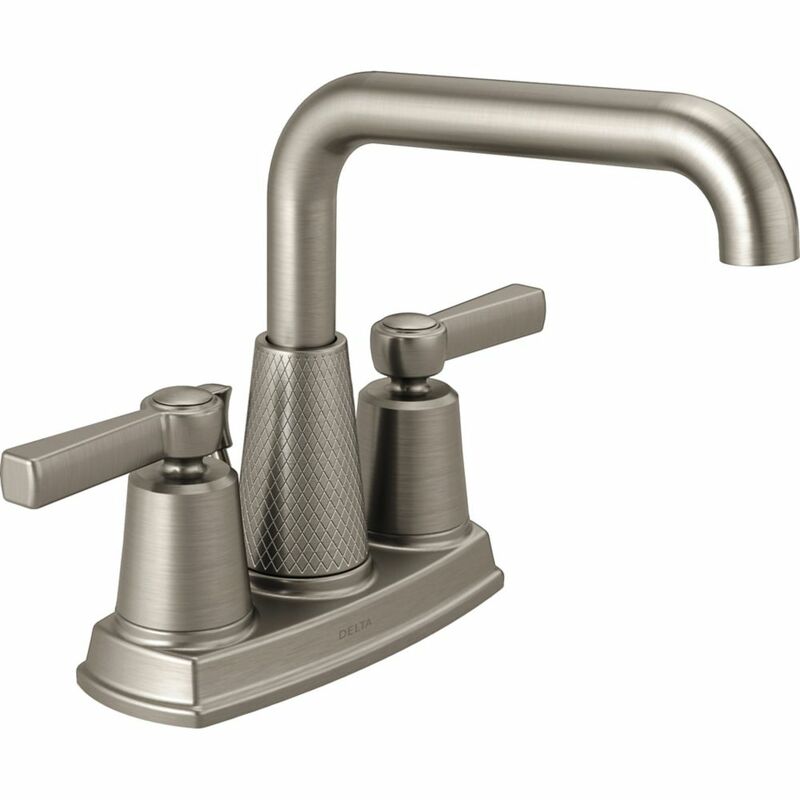 Allentown Centerset (4-inch) 2-Handle High Arc Bathroom Faucet in Brushed Nickel with Lever Handles Add a modern look to any bathroom with this piece from Delta. Turn your bathroom into a stylish space with this dual-control faucet. This item's easy-to-install deck mounted design gives a fresh look to any counter top. This faucet is WaterSense certified, using less water to work so you have a smaller utility bill. Allentown Centerset (4-inch) 2-Handle High Arc Bathroom Faucet in Brushed Nickel with Lever Handles is rated 4.7 out of 5 by 23. Rated 4 out of 5 by Brtibulldog from It looks great I installed it and it instantly made the bathroom sink look very modern. Sleek finish. The only negative was installing the plunger rod under the sink it comes loose very easily despite numerous adjustments. Rated 3 out of 5 by Norm66 from Love the swivel spout This faucet looks very nice and enhances the look of the sink. The reason I am giving 3 stars as it is advertised as spot resistant. But I find it is not really spot resistant. Other than that it is a great faucet that works very well. Rated 5 out of 5 by Love from This faucet is absolutely beautiful and so unique! The... This faucet is absolutely beautiful and so unique! The install was straightforward and the quality is excellent. Very happy with this purchase and highly trecommend it! Rated 5 out of 5 by Lacey from Beautiful faucet--just as beautiful in person as it was in... Beautiful faucet--just as beautiful in person as it was in the photos. I chose this one because it's so different from all of the other faucets people have...and it did not disappoint! Rated 5 out of 5 by Zee from Looks great and works wonderfully. Liked the extension into the sink basin and the height of the... Looks great and works wonderfully. Liked the extension into the sink basin and the height of the faucet.